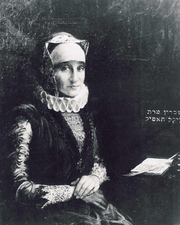 Glückel of Hamel was a Jewish businesswoman and trader whose memoirs -- written in Yiddish -- provide a remarkable account of Jewish life in Germany in the late-17th and early-18th centuries. Glückel of Hameln is currently considered a "single author." If one or more works are by a distinct, homonymous authors, go ahead and split the author. Glückel of Hameln is composed of 21 names. You can examine and separate out names.